The new £36 million coater, situated at the Cowley Hill site, St Helens, is one of the most advanced facilities of its type in the world, and is due to start manufacture in November. The coater will enable ultra-thin special coatings to be applied to glazing solutions, allowing for an extensive range of high performance energy-saving glazing products to be produced. Continue to read for more information. Dating back to the 1870s, the Cowley Hill site, St Helens, has been at the heart of some significant developments in Pilkington glass technology. The completion of the new, cutting edge, off-line coating facility – built by local building contractors Barnfield Construction – marks the latest of these, and the start of a whole new era of high-tech manufacturing for the company. Britain’s first jumbo off-line coating plant, built to produce the new Pilkington K Glass™ S range as well as the existing Pilkington Suncool™ and Pilkington Optitherm™ lines, will allow for a wider range of glazing solutions to be manufactured in the UK. 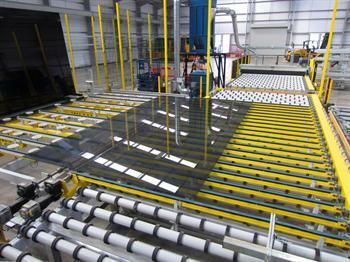 The £36 million investment, incorporating the latest technology from the world’s leading coater manufacturer, has increased the capacity and capability to produce an excess of 10 million sq metres of glass per year, helping the Cowley Hill site meet the increased demand for energy efficient glazing solutions from across Europe as well as the UK market. Its £1 million investment of dedicated quality control facilities helps set new standards in both scale and performance. It’s on-site test laboratory, mini-toughener, highly energy-efficient electric glass transporters and sensor-controlled lighting, along with its high quality water recycling and treatment processes, helps maintain a high volume of production whilst also minimising the carbon footprint of the glass being manufactured. To read more about the Pilkington K Glass™ S range as well as Pilkington Suncool™ and Pilkington Optitherm™ or alternatively please visit our product directory.